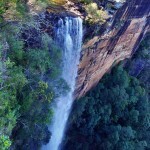 Just got back from the coast again, only this time stopped at Fitzroy Falls and took some pics. One thing that did annoy me thou was the placement of the sign labelling the falls. It was all along the front of the lookout protruding out like an awning from the railing. As a result it blocked almost every angle of getting a decent picture. A sign a few metres back on the side rails would have been perfect but maybe they wanted to sell some postcards from the tourist shop that had been taken by helicopter. First image is the view of the falls, the other is the view from the top of the falls down the valley.